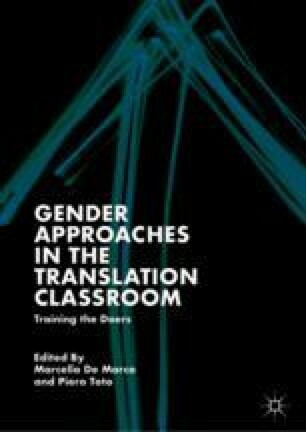 As translation is highly influential, in order to reach gender equality in society, the teaching should be centred on applying gender-active translation strategies within the framework of feminist translation studies that include non-sexist and inclusive linguistic strategies in the translation decision-making process. University marketing offers an ideal field of application, since gender equality is part of the institutional discourse. A gender-sensitive translation approach for the teaching of advertising translation, based on a contrastive and translational dimension, is developed in this article. The employment of effective gender translation strategies in the translation process is presented and discussed. These strategies and techniques favouring gender equality are based on the generalization/neutralization of generic male forms and visibility of both genders in translated texts. Fischer, Beatrice, and Michaela Wolf. 2009. Leitfaden zum geschlechtergerechten Sprachgebrauch. Available at https://transvienna.univie.ac.at/fileadmin/user_upload/z_translationswiss/Studium/Wissenschaftliches_Arbeiten/Geschlechtergerechtes_Formulieren_FischerWolf.pdf. Accessed 13 November 2018. Marimón, Carmen, and Isabel Santamaría. 2014. Guía para un discurso igualitario en la Universidad de Alicante. Available at http://rua.ua.es/dspace/handle/10045/18083. Accessed 13 November 2018.